There really isn’t a word for “thank” in the Old Testament. When worlds like “thanks” or “thanksgiving” appear in English versions of Hebrew scripture, they’re translated from words with the primary meaning of praise and/or confession. It’s a different thing than what we mean when we say “thank you” in English. 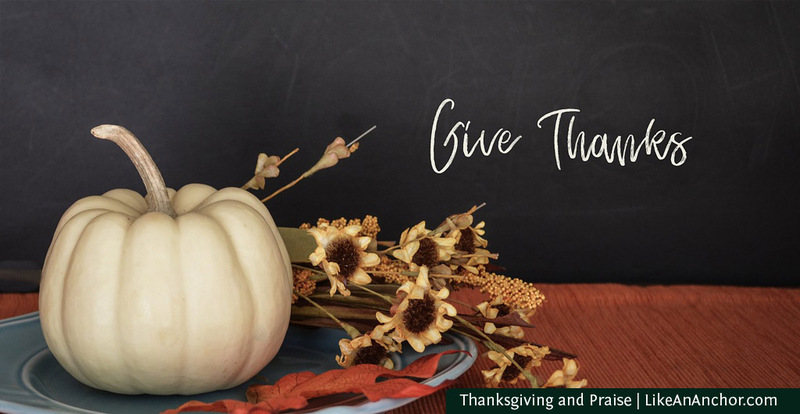 Much like we saw last week in the New Testament connection between thanksgiving and grace, the concept of thanks in the Old Testament is inextricably linked to confession, praise, and sacrifice. There’s something more/different going on in these words than we might think just reading it in translation. The Hebrew word yadah (H3034) is a root with the primary meaning of “to acknowledge or confess.” It is used in three main ways: to confess individual or national sins, to proclaim or declare God’s attributes and works, and to convey man’s praise of men. Its derivative todah (H 8426) has a similar meaning and it is also used of the sacrifices connected to praise and thanksgiving. Yadah and todah in relation to God are about confessing or acknowledging something that is true. We can confess that we are sinful before God, as all are (Rom. 3:23). We can also confess that God is worthy of all praise, exhalation, and thanks (2 Sam. 22:50). In fact, yadah “is one of the key words for ‘praise'” in the Hebrew scriptures. It’s rendered thanks only because “praise leads regularly to thanksgiving” (Theological Wordbook of the Old Testament, entry 847). The dictionaries I looked at mostly link the thanksgiving aspect of todah and yadah with praise and sacrifice. Even so, let’s spend some time with the confession part of the meaning. Obviously when we’re confessing sins we don’t thank God for them. But confession is usually made while asking for forgiveness, which is something we should be thankful for. I think this is where the Hebrew concept of thanks connects to the New Testament. When we confess our sins, repent, and ask for forgiveness today we’re covered by grace in the blood of Jesus Christ (if you remember last week’s post, the Greek words for “thanks” comes from the word for “grace,” charis). Grace connects our thanksgiving with both confession and sacrifice. All the confessing and sacrificing in the Old Testament pointed toward a time when God would unlock grace through Jesus’ sacrifice. And that is truly something to offer thanks and praise for. 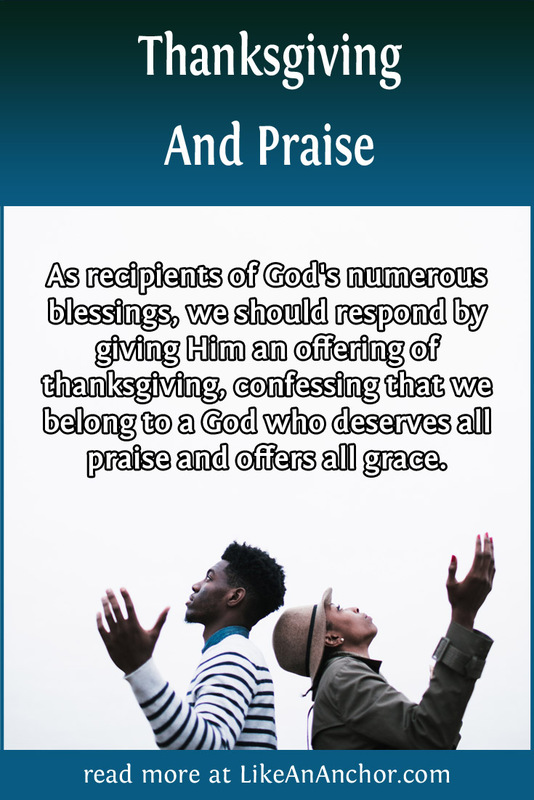 When we offer thanks to God, if we’re doing it in the Hebrew sense, we’re acknowledging, confessing, and praising Him for who He is and what He does. Of course we can (and should) thank God for good things happening in our lives, gifts He gives us, and things like that. But thanksgiving toward God should be a little deeper than just, “Aw, thanks. That’s nice of you.” Thanksgiving is about who He is. Properly thanking God includes acknowledging that He is magnificent and that every good thing in your life and in the whole universe comes from Him. This includes public as well as private acknowledgement. Thanks isn’t just something we express in private or in the prayer before a meal. It’s part of our praise. There was a whole classification of offerings in the Old Testament called thank offerings (todah). They were a type of peace offering that included 3 types of unleavened bread as well as a leavened bread. Part of the offering had to be eaten by the priest on the same day as the offering (Lev. 7:12-15; 22:29). When you think about it, we still hearken back to this aspect of thanks today every time we talk about “giving” thanks. Giving is similar to offering. As recipients of God’s grace, love, and numerous other blessings, we should respond by giving Him a gift of praise and thanksgiving. We ought to proclaim Him and confess that we are His both in public and in private, as well as quietly and aloud. Thanksgiving should become a key part of our lives simply because we belong to a God who deserves all praise and offers all grace. ← What Does Each Myers-Briggs® Type Look Like If They Get Stuck In A “Loop”?